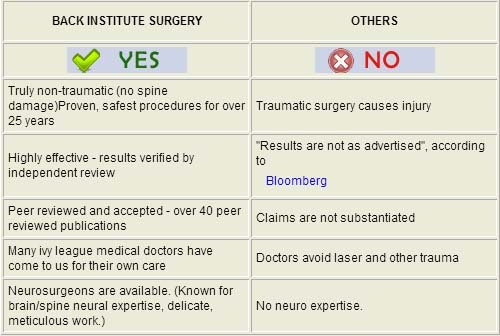 Why are Non-Traumatic spine procedures at the Back Institute better for me than surgical options at other facilities? Why is Back Institute Surgery Center of Beverly Hills the best and safest surgery center to have my procedure performed at? What are the risks of your Non-Traumatic procedures? What type of anesthesia is used for Lumbar Non-Traumatic procedures? Can spinal stenosis or foraminal stenosis be treated? 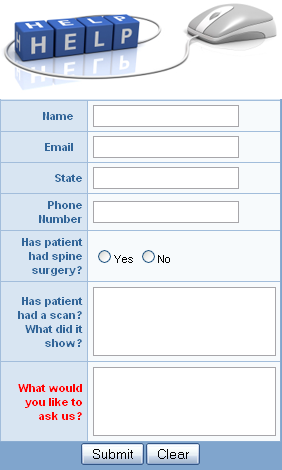 How many spine procedures will I require to solve my back pain? Am I a candidate for a Non-Traumatic spine procedure if I have already had an open operation that didn't work? Are there any medications that I should avoid before having a Non-Traumatic Discectomy at the Back Institute? Can I drive after a procedure? When? I have a protruding or herniated disc. Can it be removed? How do I determine if I am a candidate for a Non-Traumatic Discectomy at the Back Institute? How long will I have to stay in Los Angeles if I am coming from out of town? What will my limitations be after having a Non-Traumatic Discectomy and will I have to miss any work? What arrangements do I need to make to have a procedure at the Back Institute? Why don't more surgeons around the country perform Non-Traumatic Discectomies? May I request a specific surgeon? What is the best way to learn about my treatment options if I think I have a herniated disc? What should I do first to relieve the pain and symptoms of my herniated disc? Is it possible to have a herniated disc and not have the symptoms? If I already have hardware in my back, will it affect my surgery? How long is the rehabilitation period? What is the difference between a bulge and herniation? I only want my mri reviewed by back institute. What do i do? At the Back Institute, we perform the most advanced non traumatic procedures available with the most technologically advanced surgery tools and equipment. Some of our technology is only available at the Back Institute. With a Non-Traumatic Discectomy at the Back Institute, there is no cutting, no bleeding and no scarring. Patients are left with only a dot opening that is covered with a band aid. Our surgery center has the highest level of certification. From all aspects of surgery, the Back Institute is the safest and most advanced center for Non-Traumatic Surgery anywhere in the world. Back institute is a prestigious institution at the highest level, and in fact ahead of the other top institutions (Ivy League, etc.) in the field of spinal non-traumatic access for disc disorders, which is why many doctors from these other top institutions have come to us for their own spine procedures!! The fundamental approaches for non-traumatic access spinal disc removal were invented here. Since 1986, we have developed a lengthy resume of peer reviewed publications (more than 40 in the non-traumatic access field) and have taught our advanced techniques around the world. The fundamental approaches of non-traumatic access spinal disc removal procedures were invented here. We have developed a lengthy resume of peer reviewed publications and have taught our advanced techniques around the world. Our surgery center has the highest level of certification available. From all aspects, the Back Institute is the safest and most advanced center for Spine Procedures anywhere in the world. All of the equipment is specific to Non-Traumatic spine care and doing more procedures in the least traumatic way possible. Complications are almost non existent at the Back Institute. Higher risk operations, such as laminotomy, foraminotomy, MED, and microdiscectomy are done around the country at other facilities. The description "minimally invasive" that centers are using has lost its significance. These so called minimally invasive procedures are actually very invasive because surgeons are cutting muscle and removing bone to get to the disc. They are just doing it through a smaller opening, so they call it minimally invasive. At the Back Institute, we do Non-Traumatic procedures, where there is no muscle cut, no bone removed, and no stitches. The procedures done at our center can treat these conditions removing impingements to the spinal or foraminal canal and freeing the nerve. Pain and symptoms can be relieved. One procedure is usually sufficient to treat a patient's spine problems. However, some patients need treatment at multiple levels and this can also usually be treated during the same operation. Very rarely a patient needs to return for a second surgery. There are rare cases where patients re-injure themselves and need to return for another procedure. Yes, many spine problems can still be corrected following a failed surgery or can be redone using a non-traumatic method. Sometimes patients injure discs at different levels than what was treated in a previous operation. Non-Traumatic spine procedures will not create more instability in the spine and will not create more scar tissue, unlike an open revision surgery. Patients should avoid any type of blood thinning medication whether over the counter or prescribed. If a patient is taking a prescribed medication, such as Coumadin, please consult your doctor before discontinuing its use as a medication prior to surgery. If you are taking any other medications, please inform us at the time you schedule your procedure so we can instruct you on a case by case basis whether to continue them or not. Can I drive after surgery? When? Patients cannot drive immediately after a procedure. However, 24 hours after coming out of conscious sedation will be a safe time to start driving again. I have a protruding or herniated disc. Can it be treated? Yes. The main purpose for doing a procedure is to remove the offending disc material while not causing trauma to the surrounding tissues. Some centers feel that cutting the bone and freeing up some space around the problem is enough. Our position is that there is no need to dissect and traumatize the surrounding tissues instead of treating the disc herniation/protrusion itself. 3 nights in Los Angeles is the typical stay for patients from out of town. We have a 2 day program in some cases as well. Patients do not need to stay overnight in the surgery center since the procedure is outpatient, however patients will get to enjoy 3 nights in a nearby Los Angeles or Beverly Hills Hotel. Patients begin with passive therapy after the procedure (massage, ice, heat). After 2 weeks patients move on to pool therapy, and then at 4 weeks, patients begin active physical therapy. Most patients can return to work a couple of days after having the procedure. If a patient's job is strenuous, then we recommend waiting 6 weeks or starting with light restricted duties such as desk work. What arrangements do I need to make before having my procedure at the Back Institute? Due to sedation, patients cannot drive themselves after a procedure. Patients need to bring all medications they are currently taking. Because they are not able to actually do it, they just describe their work as the same thing, which it is not. The advancements in proprietary equipment and totally non-traumatic techniques that the Back Institute has made over the last 20 years make us the leader in performing Non-Traumatic Spine Procedures. (Shown in over 40 peer accepted publications.) Many surgeons around the country, even in the biggest centers, claim to do "minimally invasive" spine surgery when the fact is their surgery is very invasive. The problem is that the words "minimally invasive" have no defined meaning. 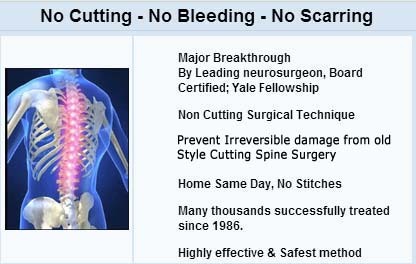 Today, surgeons around the country are not able to provide what is TRULY "minimally invasive," which is not to cut muscle, not to cut and remove bone, not to cause scarring, and not to alter the normal anatomy of the spine to get to the problem disc area. Spine centers around the country rely on clever marketing and catchy words like "laser" to attract patients, but they are missing the experience, expertise, credentials and technology to do a Non-Traumatic Procedure. 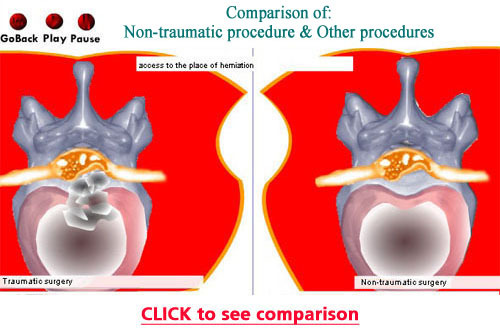 Back Institute is the only center in the world that can truly accomplish these actually Non-Traumatic techniques, and that is why our procedure is a "Non-Traumatic Discectomy", with NO access damage. An MRI is the best way to tell what is going on in the spine. Your local doctor can prescribe one for you. You can then fax in the written report and mail the actual films or CD to the Back Institute for a free evaluation. There are many things that can cause herniations including falling, having an accident, aging, and working. Many patients first try physical therapy, injections, pain management, or chiropractic care to relieve pain and symptoms. Sometimes these treatments may relieve pain temporarily, however they cannot cure a herniated disc. A Non-Traumatic Discectomy is the next safest option for treating a herniated disc. Yes, occasionally people have a herniation and don't realize it. Symptoms can include pain, numbness, tingling or weakness. If I already have hardware in my back, will it affect my procedure? We will have to review your MRI results in order to determine this. Sometimes the hardware can be removed and sometimes we will be working at a different disc level, so the impact will be minimal. Patients walk out of the surgery center the same day and some fly back home the next day after their procedure. Many return to work within a couple of days. Desk work or non-impact work is required for 6 weeks. Physical therapy also lasts 6 weeks. A herniation is a more extreme bulge, in which a tear in the outer, fibrous ring of an intervertebral disc allows the soft, central portion to bulge out. This tear in the disc ring can put pressure on the spinal cord or the nerves exiting the spinal cord. Please contact our office at 310.551.0690. A Patient Coordinator can assist you. Please call us at 310.551.0690 and provide us with your insurance information. We will be able to verify your benefits and tell you what services your insurance covers.